How often should you post on Social Media? It's something that keeps us up at night. Okay maybe it should keep us up at night but it doesn't. We leave the sleepless nights to the gurus of social media! However it is something that you need to consider. First of all we think you need to get right your content but once you have established what you should be posting you need to consider when and what frequency. You only have to Google "frequency of social media posts" to get some idea of the variation of recommendations which only reinforces the art not a science aspect of content sharing with your audience but it doesn't mean you shouldn't test it out. There is no definitive right nor wrong just what ends up working better for you. Have a read of this blog with neat infographic shared below. It's a simple but good read. TripConnect involves bidding for placement in price and availability search results. Your bid, relative to the bids of others, will determine where you appear. Below are some strategies to consider, both for properties who have relationships with online travel agents and those who don’t. If you work with online travel agent, there will already be links to these partners in your property’s pricing and availability search results. In a group-bidding scenario, the top three bidders will receive prime placement for their links. Additional special distinction is given to the top bidder’s link. If you appear in Positions 1 through 3, your link will also include an “Official Site” icon, so travelers know this price is being offered by the property itself. The rest of the bidders that meet minimum bid amounts at the time of the search will appear in text links below the three main links. First position, automatically: During set up, TripConnect will automatically populate bids to put you into first place across all TripAdvisor markets. If desired, you can make adjustments from there. The tool will show you how your changes impact your positioning, projected clicks and cost. Returning to first position: You’re only in first position at the point in time when you set up your campaign. While your campaign is running, other partners may increase their bids so they can be in first position, which will push your link lower in the search results. To return your property to first position, click “Edit” next to your Average CPC bid on the TripConnect Campaign Management page. Then click the “Bid to 1st position in all markets” button. Keep an eye on things: When you’re running a campaign, you should regularly check your property page and see where your link appears. This can help you judge if you need to adjust your bids for a better placement. Keep in mind, you may be in first position when you set up your campaign, but that can change over time as other partners adjust their bids. What you’ll pay: If a traveller clicks your link, you’ll be charged your bid amount, no matter what position you’re in on the site. A global approach: You may be tempted to pull back on bids for domains outside your home market. Generally, it’s a good idea to start at first position in each domain, so you can see which ones drive the most traffic. This will need to be monitored daily. Over time, you can make adjustments. Reach travellers everywhere: It’s also a good idea to place desktop and mobile bids. This will help you reach travellers no matter where they’re researching your property. This will need to be monitored daily. Over time, you can make adjustments. If your property doesn’t have a relationship with an online travel agent, your link will be the only one listed in your property’s price and availability search results, and it will automatically appear at the top. Your link will also have the “Official Site” icon next to it. In this case, TripConnect will provide the minimum bid you need to place to display your link. This minimum bid is based on market prices. Because you don’t have any direct competition, your minimum bids will vary based on market prices. You will see these changes when you configure a new campaign, but you won’t see fluctuation while you’re running one (unless you sign up with an online travel agent). Consistency is key: Because you don’t have an online travel agent, it’s important to keep your TripConnect campaigns running without interruption. This will help ensure that you always present pricing and availability information to travelers who are interested in booking. What you’ll pay: You’ll be charged your bid amount whenever a traveler clicks your link. Global approach: In your case, it’s even more important to place bids across each TripAdvisor market. The ability to show pricing and availability information right on your listing will maximize your opportunity to book travelers outside of your home market. 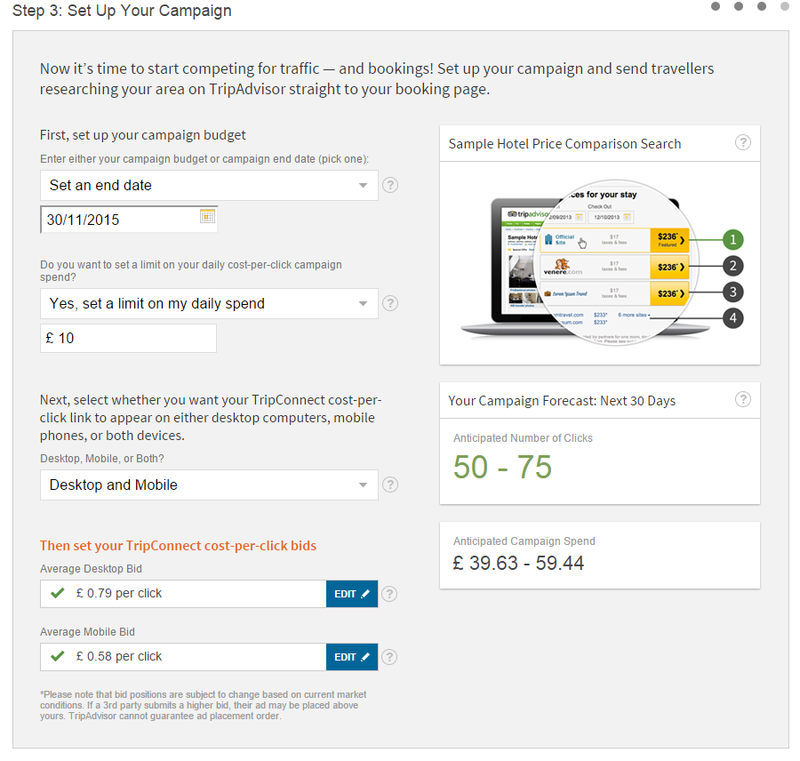 You can see the most up-to-date metrics for your TripConnect campaigns on the Campaign Management page. This page will show you the amount spent, revenue generated and room nights sold. You can also make adjustments to your current campaigns, and set up new ones, from this page. There is no minimum spend to participate in TripConnect, but there are minimum bids to have your link appear. You will see these minimums when you set up your campaign. You can set an overall budget for your campaign, to ensure it aligns with the money you’ve allocated for it. You can also set daily spending limits to ensure you’re not using too much money in one day. When you’re first getting started, try setting up a campaign with a specific budget. Closely watch the Campaign Management section of the tool to see how long your money lasts and how successful the campaign is for your business. As you become more comfortable with traffic patterns, move to monthly campaigns with no budget restrictions. This will help you maximize your opportunity for clicks. Using monthly campaigns will also help you judge the times over the year when your property sees more traffic. This is particularly relevant for accommodations with significant seasonal peaks and flows. As you configure your campaign, the TripConnect tool will provide a click forecast for the next 30 days. This forecast includes an estimate of the number of clicks you’ll receive based on your current settings and market position. The expected spend is based on the number of forecasted clicks multiplied by your average cost per click for each market, aggregated globally. All invoicing will be handled electronically through the TripConnect Campaign Management tool. You can also track your billing balance on this page. You will be charged your bid price for each click sent to your booking page. No refunds can be issued on traffic that was delivered to your site. Also, no discounts are offered to any partners who participate in bidding. Your credit card will be charged every time you meet a preset spending threshold (this threshold varies by market) or every 30 days – whichever comes first. You will be billed in the same currency as your Business Listings subscription. management of your TripConnect account if required.